James Blake gives Chef Michelle Bernstein’s fiery sauce pan the deference it deserves at the 12th Annual BNP Paribas Taste of Tennis. Photos from Getty Images for BNP Paribas. The No. 1 U.S. tennis player didn’t struggle on Monday in his first-round victory on Day 1 of the U.S. Open. Before MF took to the court – a few days earlier – he and a number of colleagues were hanging out at the 12th Annual BNP Paribas Taste of Tennis in and near remote kitchens set up in the W New York hotel. Mardy Fish and Chef Scott Leibfried. A favorite breakfast for this champion is a bowl of strawberries, eggs, potatoes and some sort of carbohydrate. “I like to load up on breakfast and work my way down from there. I can always burn breakfast off as well, said MF, who has famously lost around 30 pounds and is playing the best tennis of his career, including a recent victory over world’s men’s No. 2 player, the Spaniard Rafael Nadal. The Taste of Tennis attracts some of the world’s top tennis players. Alas, Rafa was a flash in the pain, disappearing as quickly as he appeared. The jocks assist and/or observe top chefs such as Bill Moore. The Push Cart Foods owner prepared Crispy Shrimp Cakes with Spicy Aioli and Watermelon Chutney served on a Plantain Chip with Jerked Popcorn. The popcorn could cause a body to work up a powerful thirst for one of the beverages on site, including rum, beer, tea and a refreshing prosecco/watermelon juice concoction being test marketed by Jennifer Iserloh of SkinnyChef Culinary Services. 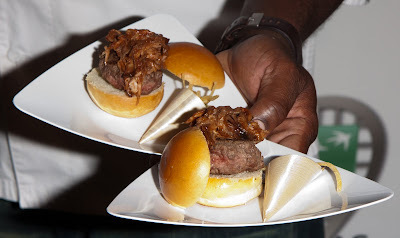 Chef Marc Anthony Bynum (MB Burger Bar) rolled out Kobe and Pulled Pork Sliders with Pomme Frites. The eats are for a hungry paying public and for a good cause. Though eyes could only feast on Rafa very briefly, there was plenty of other eye candy at the Taste of Tennis, which usually turns on the burners the Thursday before the start of the U.S. Open. World women’s No. 2 player Vera Zvonareva of Russia looked delectable with hair, makeup and smashing red sandals. Fernando Verdasco likes a good steak. American James Blake caused a stir, too, even before he helped Chef Michelle Bernstein (Sra. Martinez) wrangle Sautéed Shrimp with Pineapple, Chilies and Rum/Rum Pudding Brulee with Rum-Soaked Pineapples. With his “J-Block” raucously cheering on Tuesday, the Yonkers native won his first-round, four-set U.S. Open match with a stirring finish, while VZ won easily on Monday. She'll be back on the court today. Also advancing, in four sets on Tuesday, was Fernando Verdasco. 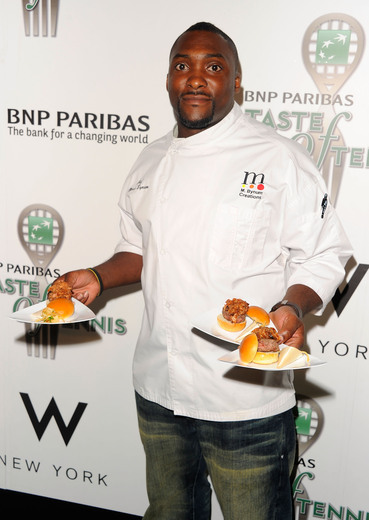 Days before his victory he hadn’t a clue about what he was to cook at the Taste of Tennis. “We’ll see. The cooker will tell me,” asserted the Spaniard. He sticks to the standard carbohydrate and protein regimen to keep himself in winning form, preferring in particular pasta and steak. “These are the two most important things for a tennis player to have … like energy and to reserve for long matches." Chef Bill Moore prepares to serve jerk popcorn and other delicacies. And what of Janko Tipsarevic? The Serb has a serious love jones for sushi. “I love Serbian food but it is really, really heavy. It’s a lot of meat, a lot of sauces,” said the winner in straight sets on Monday. “And sushi is just fish and rice, which is good and healthy for you. And I could eat a ton of it." Janko Tipsarevic and Mrs. T, Biljana Sesevic. Sushi is the word for the Serb. There was no sushi at the Taste of Tennis’ aptly named “The Centre Course,” where chefs and helpers cooked up a storm. But perhaps Chef Shea Gallante’s (Ciano) “Octopus Roll” with Pickled Onion, Jalapeño and Celery would have been to JT’s taste. 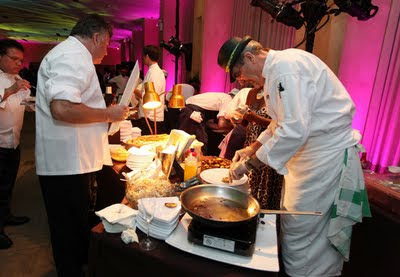 Proceeds from the 12th Annual BNP Paribas Taste of Tennis will benefit the New York Junior Tennis League. Visit http://www.tasteoftennis.com/ to learn more about the BNP Paribas Taste of Tennis and to http://www.nyjtl.org/ learn more about New York Junior Tennis League. THE Serb tennis player Janko Tipsarevic fits the profile of the kind of customer HaChi Restaurant & Lounge would relish. From HaChi Restaurant & Lounge, Seared Duck (w/crispy beets, baby arugula, pickle red onion puree, prune infusion vinaigrette. Photos by Sunny Norton. He is young/young-at-heart, hip, smart and loves sushi. Because JT has talked up the merits of fish and rice for those in his profession (see writeup above), he’d probably whet his appetite with a few HaChi chef special rolls. For instance, Fisherman Wharf (w/lobster, white fish, jumbo shrimp, mango avocado, rice cracker pinenut, kir in beer dressing); Chilean Sea Bass Roll (broiled miso marinated seabass, cooked Napa cabbage, orange vinaigrette, sweet miso drizzle), or Crazy Tuna (spicy tuna, crunch, black pepper tuna, scallion on top). Sushi lovers who don’t wish to roll with rice can try a Naruto roll (w/cucumber): Spicy Tuna, Spicy Yellowtail, Eel & Crabmeat or Rainbow Naruto. HaChi Restaurant & Lounge opened in late July with a party and media preview. The two-level HaChi is the newest Asian fusion restaurant on New York’s Lower East Side. 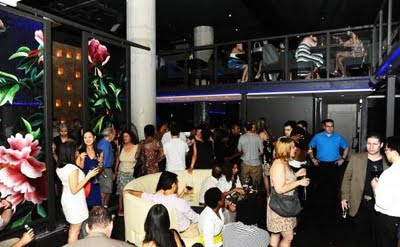 It is a room in which the lounge and restaurant atmosphere are fused seamlessly. Track lighting sets just the right mood for an evening out. Glass panels with floral motif book-ended by white columns and booths framed by slate gray railing downstairs lend an intimacy to the space. The cocktail bar, sushi-prep station and a series of booths lining one wall are islands unto themselves. The centerpiece of the lower level are curved white banquettes (How, oh how will they keep them clean?) that are a perfect venue from which to see and be seen. Eventually, live music, a happy hour and a reverse happy hour will be part of the mix. HaChi opened with a swanky party in late July, promising that its fusion fare is a cut above the typical, owing mainly to its “unique" dishes, top-shelf ingredients and French cuts of beef, fish and chicken. Something along the lines of a Calamari Martini with a 72-hour vodka marinade. 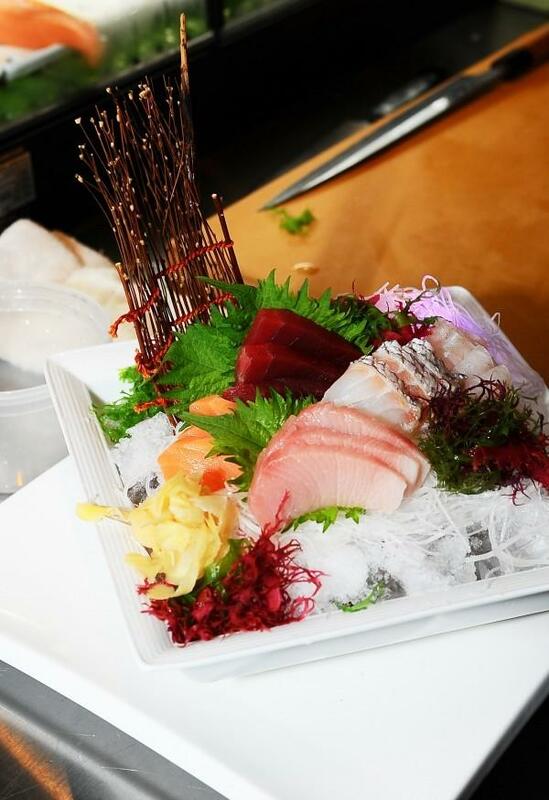 A selection of fresh cuts from HaChi, including tuna, salmon and white fish with garnishes. Guests didn't sample calamari martini but feasted on several other dishes, including the Filet Mignon Roll (wasabi/mashed potatoes, carrot & ginger puree, sweet & sour pink pepper corn sauce) and Seared Duck (crispy beets, baby arugula, pickle red onion puree, prune infusion vinaigrette). 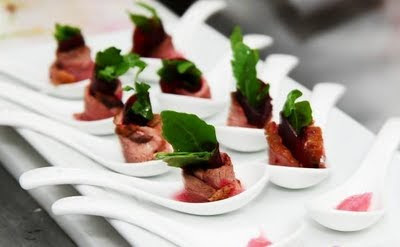 The pair of appetizers has a nice balance of flavors and at their center succulently tender morsels of animal protein. Hachi Chocolate Truffles (bittersweet chocolate/pickle red onion puree, caramelized pistachio dust, candy kumquats) fuse for an exotic taste sensation. This could be a hardsell. HaChi expects to introduce a late-night menu shortly. At the moment the main slate is an accessible, affordable (not cheap, not expensive) mix of the aforementioned dishes, as well as soups (Asian Pear), salads (Sesame Chicken, featuring cucumber spaghetti), hot (foie Gras Torchon) and cold dishes (Champagne Scallops), omakase, a la carte sides (Truffle Mushroom Risotto) and desserts (Caramelized Kumquats). Visit http://www.hachinyc.com/ to learn more about HaChi Restaurant & Lounge. Great article! Makes me wish I was there to eat some of Push Cart Foods' Crispy Shrimp Cakes with Spicy Aioli and Watermelon Chutney served on a Plantain Chip with Jerked Popcorn chased by Skinny Chef's refreshing prosecco/watermelon juice. Ummmmm! Thanks. Other types of sports betting are total margin, exotic singles in term,sportsbooks live bets and Asian handicap.